“Kid’s Club” activities are geared toward helping kids become more excited about the bible! It’s a great way to learn about God’s word through hand’s-on approaches such as crafts, mission projects, games, devotions, and more. Children will experience how fun it is to grow in their relationships with Christ and act on their faith. MAIN IDEA: We will show the fruit of the Spirit when we trust in Jesus as our Savior and actively live our faith! PREPARATION: Give each child a coloring page and disperse the crayons and markers. Read Galatians 5:22-23 and explain the qualities listed in the verses. Ask the children to give examples of each quality (e.g. “patience means waiting for dinner to be ready instead of bugging my mom”). Help the class understand that as we grow more mature in our faith we will show these qualities in our lives. 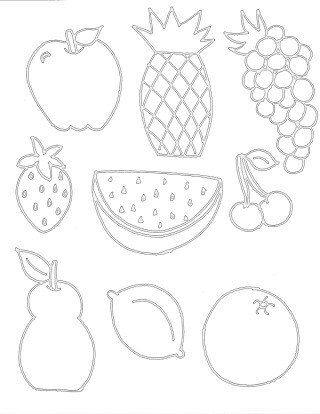 Pass out the coloring pages and help the children use markers to write a quality on each fruit. Then they will color the page, cut out the fruit, and glue or tape the fruits to a colored piece of construction paper. Lastly, help the children write, “The Fruit of the Spirit, Galatians 5:22-23” at the top of each paper. Display the children’s artwork somewhere in the room or hallway. PREPARATION: Clean and slice the fruit and place into separate baggies. Tell the children the different types of fruit you have and see if they can work together to assign a character quality from Galatians 5:22-23 to each fruit (without reading the verses). An older volunteer may list the fruits and qualities on the white board while you prepare the snack. After blessing the food, discuss with the class some ways to practice showing the fruit of the Spirit and make the distinction that only when we trust in Jesus as our Savior can we truly show these characteristics. Share the gospel message with the class and give an opportunity for the children to ask questions about salvation or baptism. PREPARATION: Give each child a handout and writing utensil. Ask the children to spend some time in silent prayer to ask the Lord to help them understand his word. Then they will reflect on ways to show each fruit of the Spirit and write down their chosen method (help the younger children write their answers). Remind the children that spending time in prayer, reading the bible, and reflecting on what God wants us to learn is how we grow stronger in our faith. Emphasize the importance of remaining quiet during this activity so everyone may work without distractions. Take prayer requests and ask for volunteers to pray. Close the prayer by asking the Lord to help everyone show the fruit of the Spirit. Tony Kummer (Editor) reviewed & updated this page on : September 19, 2016 at 2:32 pm. All our content is peer reviewed by our readers, simply leave a comment on any post suggest an update.